We passed by Fanatico one day from the main road and it stood out so much from the shopping center it is a part of that we made it a point to go there. 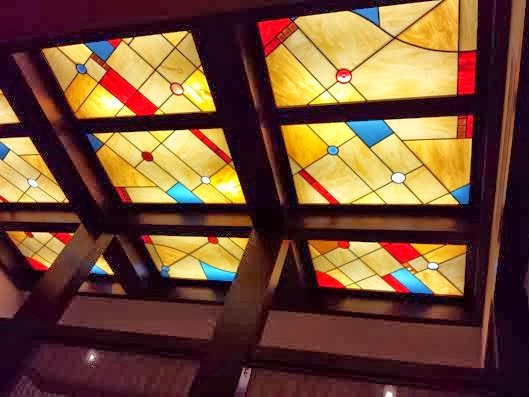 The interior doesn't disappoint, with the stained glass accent ceiling, variety of tables from high top booths, half booths and tables, and wine bottle lined dining rooms. After looking over the menu, we decided to try the baked clams and mini rice balls for appetizers and the Balsamic Glazed Chicken Primavera and Homemade Rigatoni Marsala for entrees. A basket with a variety of breads was brought to the table and it was some of the best bread I've had at any restaurant. The two memorable ones were a pizza bread with sliced red onions, tomatoes, cheese and black olives, and another bread with cranberries. They were absolutely delicious! The Baked Clams Arreganate were on the small side, but there were 8 of them so it was fine for two people. They were small because it was a whole clam with a bread crumb topping versus the chopped and overstuffed with breadcrumbs type of baked clam. As for the rice balls, the sauce they came with was excellent but the balls themselves were a little too plain. I really missed the meat center that I love in rice balls. When the food was being brought to the table I didn't realize it was for us and I said, "wow that food looks so good!" and then it was placed in front of us! 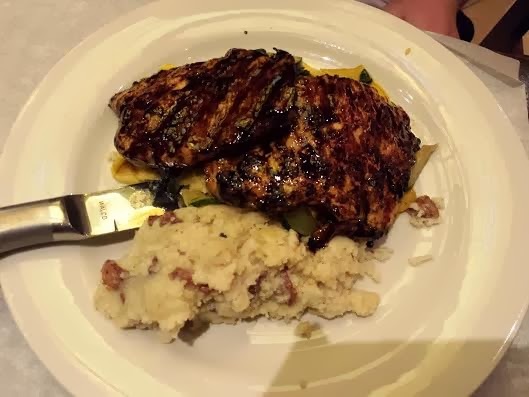 If only the Balsamic Glazed Chicken was as good as it looked. The flavor was spot on but it was very thin and dry, as was the mashed potatoes. It came with a side of shaved yellow squash and zucchini that took over so much of the plate that everything else was out of proportion. You have to really love squash to eat that much of it. For the price, it's not something we'd order again. The Homemade Rigatoni Marsala was delicious, and the thicker rigatoni was cooked to a perfect al dente. 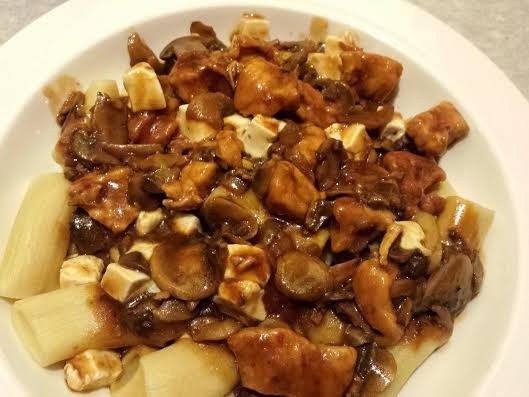 The bite size chunks of chicken was exactly what you'd expect from a chicken marsala dish and the cubes of homemade fresh mozzarella was just beginning to melt and gave it the perfect amount of salt. It's something I'll probably try to recreate at home, especially for those nights I can't decide on pasta or chicken. We got dessert, the Chocolate Mud Balls, described as ganache covered brownies, which were closer to chocolate truffles than brownies. We also got the Baby Cannoli's, which tasted fine but for $7, was in our opinion too much for such small cannoli's. Throughout the night, service was good with the exception of the very beginning. I had to ask 3 times for a lemon for my water, and the final time I was told almost in a snide way that the water is fruit water and has apples, oranges, lemons, etc in the water, and was asked if I still wanted the lemons. I really couldn't tell that at all by the taste. She did bring over a small plate with a few lemons and from there on out, she was great at filling our waters (yes the pitcher had fruit) and asking us if we needed anything else, more bread, etc.. I'd definitely try it if you are looking for some fresh homemade pasta, a place to bring a family or even for a date night. I'd probably go back to try other items from the menu and see how it fares then.